Meredith M. Dangel – Page 12 of 12 – Delighting in the different, the daily, and the divine. 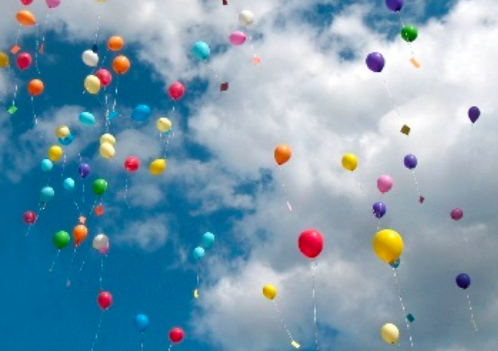 Thank you to the many folks who supported me this week as I launched my new site. It was both heartwarming and exciting to receive so many new likes and comments! I pray you’ll be blessed by these goodies! For those of you who didn’t win, I hope you’ll still check out Lindsay Letters and Emily P. Freeman. God is working through them in big ways! Grand Opening with a Golden Giveaway! Do you hear that party horn? Do you feel the confetti on your face? Welcome to my new online home! I’ve been dreaming of this day for, well, a long time. It’s my pleasure to have you here. I know you could be pretty much anywhere else at this exact moment, and instead, you’re with me. Thank you. For now, I want to say THANK YOU with a GOLDEN GIVEAWAY! 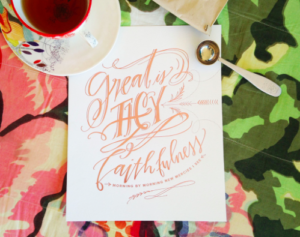 If I make it to 200 likes on Facebook by Tuesday, May 3, at 11:59pm, I will give away two of my favorites: a letterpress art print from Lindsay Letters and a book from Emily P. Freeman. Eek! Want to enter? Like my writer page on Facebook. If you feel inclined, share the giveaway announcement on Facebook. Comment here with your email address. Anyone can do this, but I want to offer a way to enter for those not on Facebook! If you aren’t familiar with Emily, you are in for a treat. She is my #1, never-miss, most favorite contemporary Christian author. I’ve been reading her blog for what seems like forever, and in my best dreams I can write books as significant to others as her first book, Grace for the Good Girl, was to me. Let me put it this way: if I asked God to please float down from the skies a book to help me understand myself in ways no one and nothing else can, he would send Grace for the Good Girl. 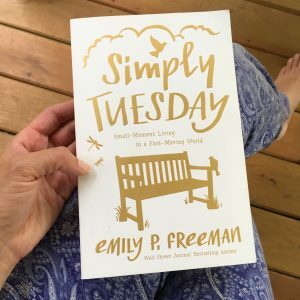 Her latest, Simply Tuesday, is not just for recovering good girls. It’s for anyone who feels their “soul is being held hostage by hustle.” (So, you know, pretty much everyone.) I find myself returning to this lovely book again and again. Even if you don’t win, please check it out. Here’s a little message from Emily. I hope you’ll agree this is truly a golden giveaway! These pieces of art represent my heart, and my prayer is that they will bless you as much as they bless me. Remember, 200 likes by 11:59 pm on 5/3. I’ll announce Wednesday morning. See you then! Please note: These gifts are from me to you; this giveaway is in no way associated with Emily or Lindsay. I’m just a gushing fan!